Atkinspire is a dental and medical consultancy run by Amanda Atkin. The business previously had a DIY site but it was not helping the business as it should have. Our brief was to produce a site that would be professional, modern, easy to use and explained her -often complicated – business in a simple and straightforward way. We created a modern looking professional website for her with a new logo. The site is also responsive design, so adapts itself to display across all devices from desktop computers to mobile phones. A major part of this project was presenting the information on the site in a simple and clear way – a difficult task in Amanda’s field of work, which tends to get bogged down in jargon. Director Amanda Atkin said: “I looked at many web design services when I was deciding who to work with, however what made Mooghill so refreshing and user friendly was the use of basic common sense and the ability to put across the compexities of web design and associated ‘jargon’ in a way which was easy for me to understand and that is a challenge for anybody!!! 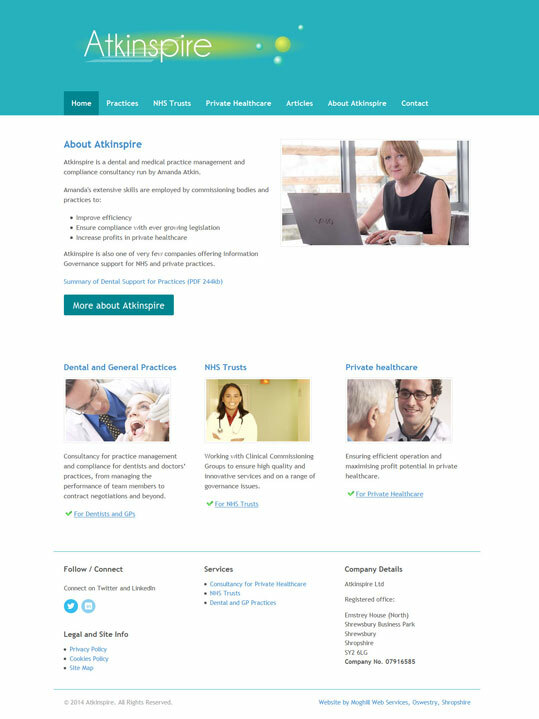 “I was able to tell Pat and Fiona what I wanted to achieve for the Atkinspire Limited website, which services were most important to promote and the look and feel I wanted to achieve. The design was completed in an efficient manner whilst I was at the other end of the country which must have presented some challenges for Moghill but never once did I feel I was causing any problems.